The Colombian Andes has three branches. Medellin is in the Central Andes and Bogota is in the Eastern Andes. There were several mountains to descend and ascend to shift from one range to another which makes it all the more interesting: shifting gear is a lot smoother. From Medellin I had to descend to the plains, where Rio Claro was situated and then climb back up to Bogota city which was at an altitude of 2700 metres. After spending 10 days in Medellin visiting some schools and universities for motivational talks, apart from typical tourist sites, leaving Medellin felt a bit difficult on several counts: the pleasant weather, green neighbourhood with lovely parks and walkways and the lovely people who stayed at the hostel. 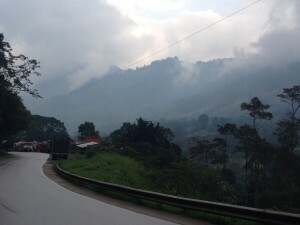 To top this, the first 10 kilometres of the road leaving medellin was extremely steep, climbing to an altitude of 2600 metres from 1600 metres. It was a well known training route for the local cyclists with each kilometre signposted like some of the climbs in the alps. 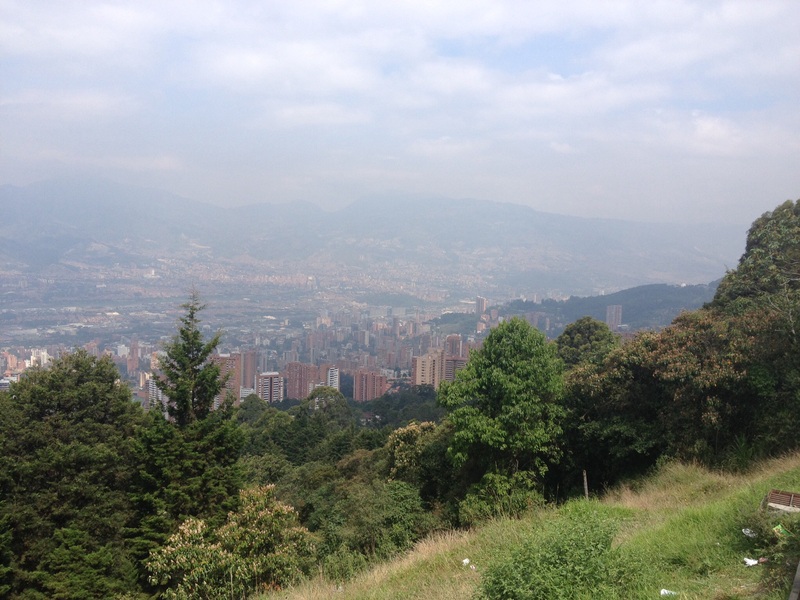 Even after an hour of cycling I had barely left Medellin, just 5 Km’s away and the whole time I could see the city below. For all the hard work I expected to be a lot further. After about 2.5 hours I managed to get to the top from where it was mostly downhill. I descended on the other side of the mountain to a much lower altitude. I knew Rio Claro was at the bottom of the mountains. So I expected the second day to be a downhill ride all the way. However, I had two big climbs, the first one about 8 Km’s long and the second one 13 Km’s. Perhaps, the mind has some capacity to prepare itself for challenges if it knows what is involved. It felt lot harder to tackle unexpected climbs. It might be arduous and painstakingly slow nevertheless the sense of achievement at the top of the climbs and the views makes up for any ‘little physical pain’. 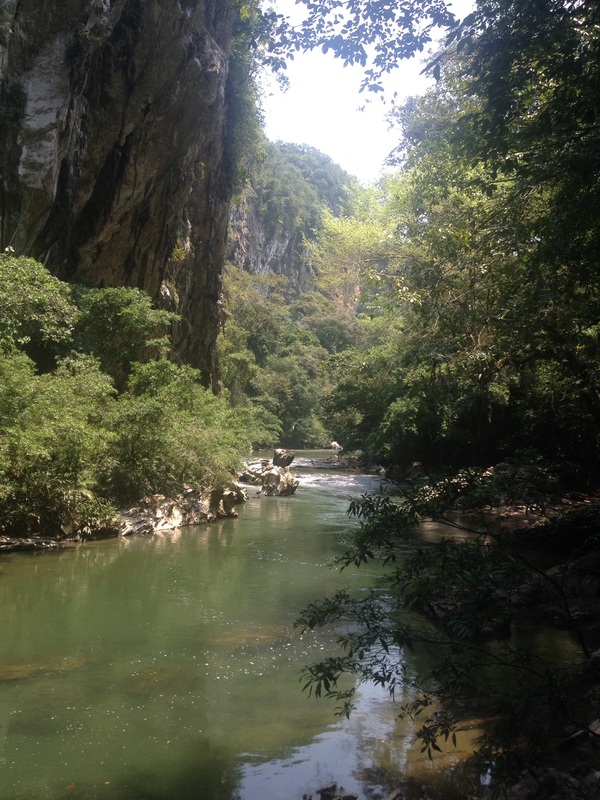 The natural canyon of the Rio Claro formed over millions of years was protected as a nature reserve and moreover in the hands of a private owner, all the profits were reinvested to grow the reserve from 50 hectares initially to 650 hectares currently. 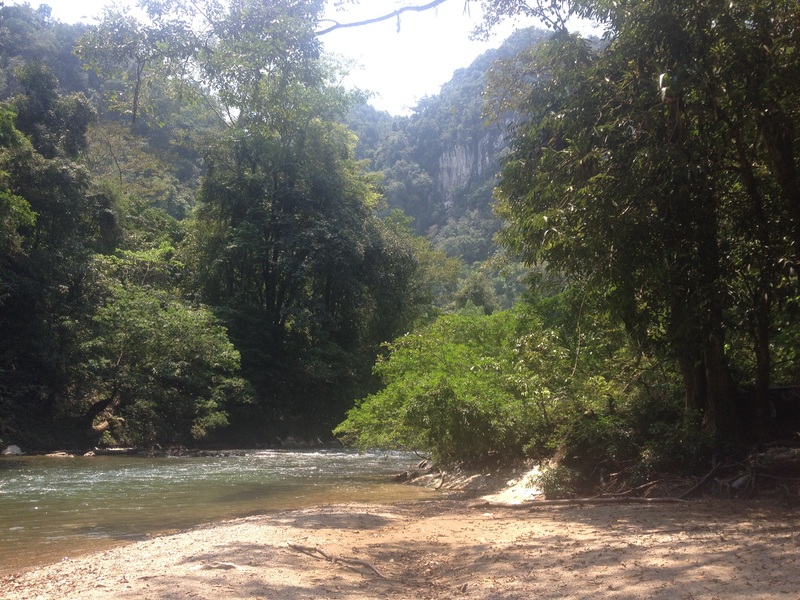 There were plenty of things to do such as rafting, caving, rock climbing and canopy tour, although doing nothing in this paradise was also a good option. The opportunity to jump into the river every time it felt hot was a luxury that I did not miss. I camped next to the river and spent 3 nights here. The rafting tour I went along with some other tourists and Colombians was well worth the money. We all jumped into the water several times. I trusted my life jacket more than my swimming skills and enjoyed it to the fullest. I highly recommend visiting Rio Claro. 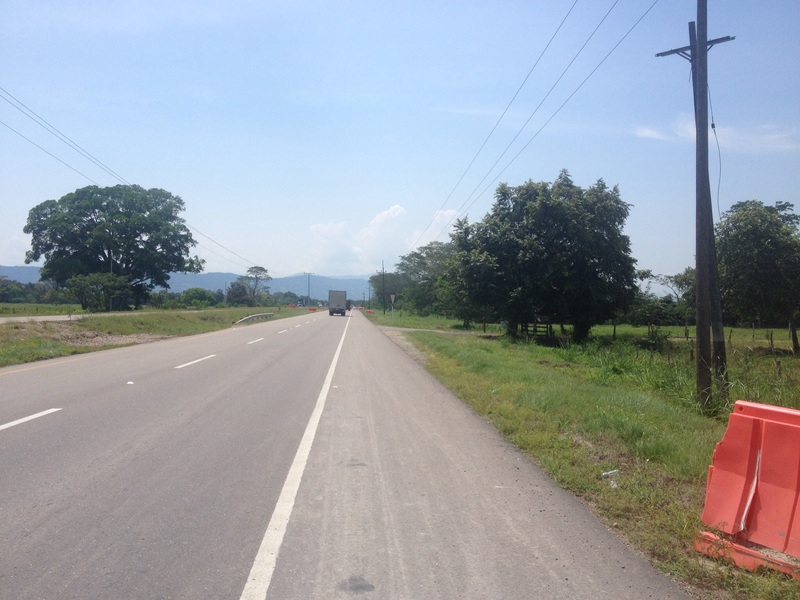 From Rio Claro to Honda was about 126 Km’s and road was flat as a pan cake. It felt good to be able to ride at 25 kmph consistently for few hours. The local Sunday riders I met on the road bought me some drinks and showed me the way to Honda. Every hotel in Honda advertised its’ swimming pool. The temperature here was 35 plus degree C and it remains the same most of the year apparently. 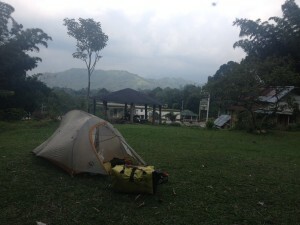 The Hondano Mirador bar which had a swimming pool let me camp in their property. It was too hot inside the tent with the fly sheet on, so I removed it half way through the night to get some fresh air. It was all good until it started to rain heavily at 5 am. That was the end of my night. 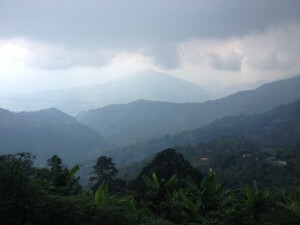 I had to quickly pack my stuff and tent and leave at 6 am.There were three mountains to climb to reach Bogota. Based on the past experiences I decided to do one mountain a day. 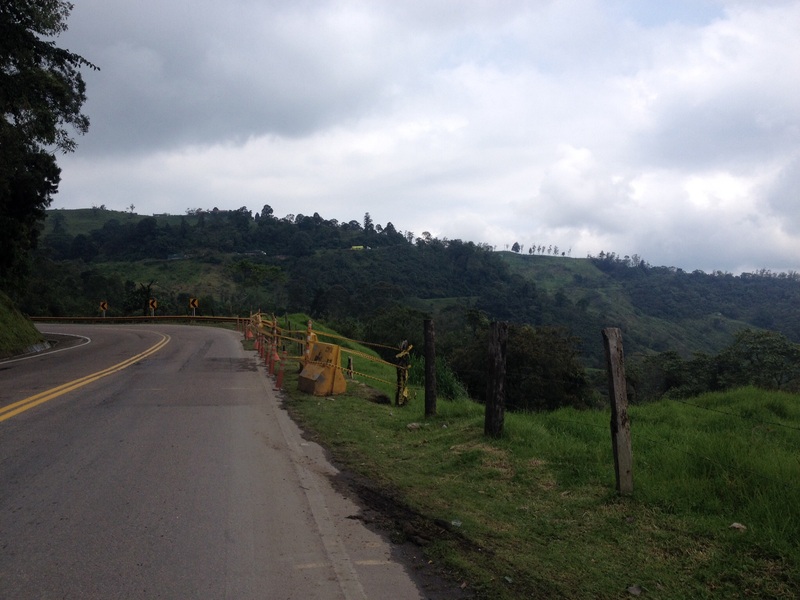 The first climb went well, 16 Km’s climb and 16 Km’s descent to the town of Guaduas. I decided to check-in to a hotel to dry all my stuff. Since I arrived a lot earlier, before mid-day, I had a lot of time to wander around the town centre. Guaduas had a nice traditional town centre, a square, stone paved roads and a cathedral in its centre. I had a good pizza (after a long time) and some italian coffee in the town centre, the whole time looking at the giant mountain which stood tall and proud on top of this village. 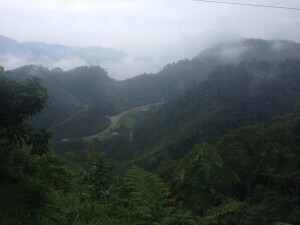 It was exciting to be able to see some of the hairpin bends that awaits me in the mountains. The second climb was not too far but steep enough to make it hard. It was about 10 kilometres followed by a descent to the town of Villeta. The third climb was the worst of all, it was too high (700 metres to 2700 metres over 30 Km’s) and too long to be able to do it in one day, so I continued after Villeta. About 15 Km’s into the climb I stopped at a small road side restaurant for food. Carlos and his mother were happy for me to camp at their property. It was a beautiful site to camp. They both were interested in some indian food. It was a pleasure to cook some chicken curry for them. 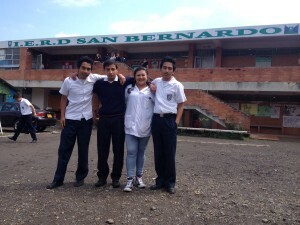 Carlos was very respectful and was keen for me to visit his school. I accepted his request and went to his school the next day. The school was in the mountains in a beautiful spot. The teachers quickly arranged a computer and projector for a presentation. Speaking in English was not an option since there was no body to translate.What the worst than can happen? I took the courage to speak in Spanish, of course broken spanish with some help. 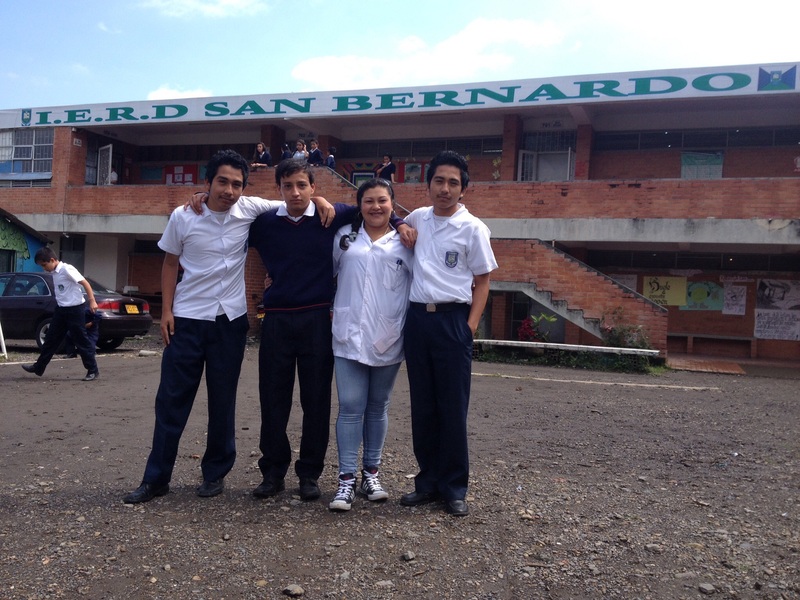 The students helped me with my language at times, and it was a good laugh. They were very respectful and seemed very innocent. I enjoyed visiting this school. Carlos was absolutely thrilled. I left the school around 1030 am and continued the third climb. Perhaps the school visit made the day for me. I was only excited to see the climbs ahead of me every time the road opened up. After reaching the top it was amazingly flat all the way to Bogota for about 70 kilometres. Riding into the city centre was not too hard, just some typical challenges of a big city; busy traffic, pot holes, broken bicycle lanes, some impatient and irate drivers. 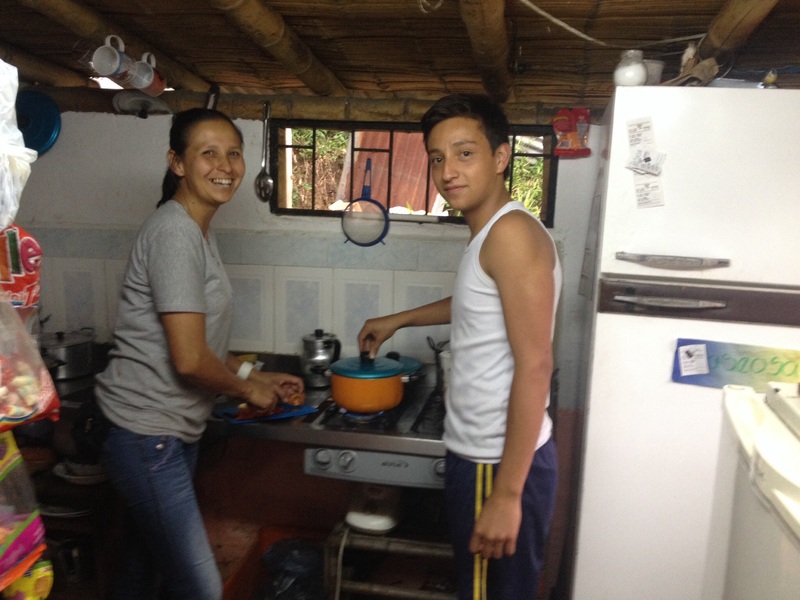 My warmshowers host, Sebastian Corrales met me in a petrol station and took me to his place. He also helped me to find a place to rent for few weeks where I am at the time of this writing. The plan is to get my bicycle serviced and also visit few schools here in Bogota over the next few weeks. 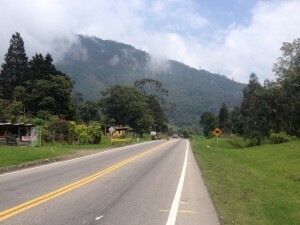 The route ( total 452 Km’s): Medellin – La Pinella (92) – Rio Claro (65) – Honda (126) – Guaduas (35) – Santa Ines (52) – Facatativa (35) – Bogota (47). Awesome. The Rio Claro sounds incredible. Thanks John, hope you are well. 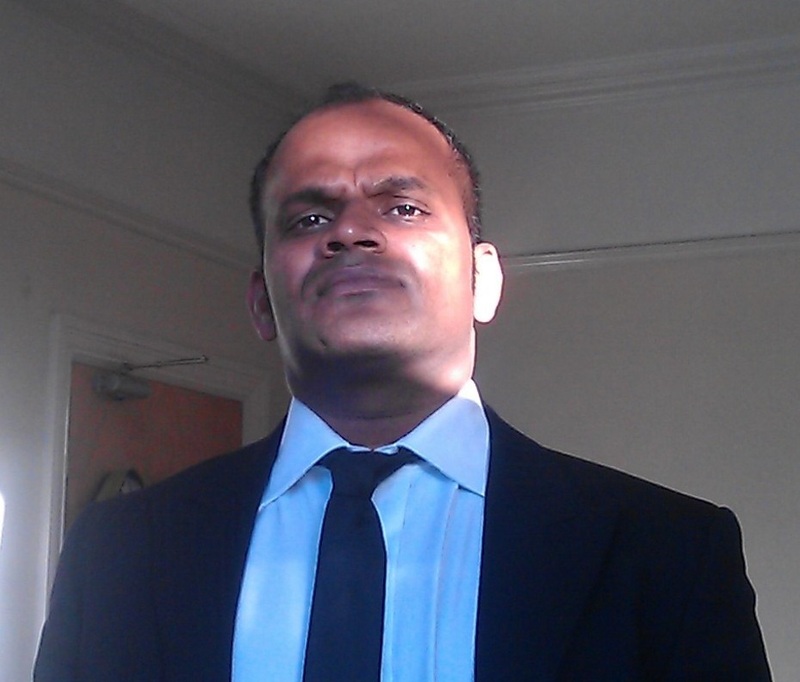 Awesome, Bala! These look like post card pictures… One question – why did you drink Italian coffee in Columbia? Such a pleasure to follow your journey. Glad to hear from you. I am glad you like it Jake. Great stuff and great views! It seems the thrill of rafting has not left you!